Organised by ESTA’s Independent Energy Consultants’ Group (IECg) and hosted by ENGIE this one day briefing (10am – 4pm) brings together energy management professionals, business energy consumers and local experts to discuss new policy, legislation and the services tasked with supporting the progress of key efficiency, emissions and UK objectives. I’m on the agenda to present within the ESOS/ ISO 50001 session. 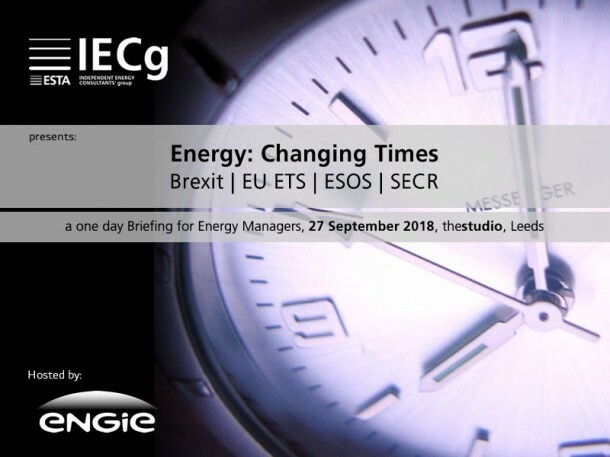 Other topics include the impact of BREXIT on UK Energy Policy; EU ETS: Where Next? ; and SECR. Click through for the conference agenda and more details.